A baby Harp Seal cries for this family reunion while waiting for its mother to return after she has been feeding in the icy waters along the coast of the Gulf of St. Lawrence. A family reunion between a mother Harp Seal and her pup happens more than once in the two week period when the mother Harp Seal returns to nurse. After the pup is born, usually in February, the mother will memorize the scent of her new family member making it easy to relocate her young after feeding in the chilly waters of the Gulf of St. Lawrence. As the mother Harp Seal finds an ice hole in the thick layer of ice across the Gulf of St. Lawrence, she comes up in search of her pup. Her whiskers are frozen after feeding on fish and sea creatures as she finds the right opening where her pup awaits the family reunion. The nursing and bonding during these family reunions continues at various intervals over approximately 12 days when the pup gains about 2 kilograms a day nursing from its mother. Weaning is very sudden and the pup is then left on the ice floes to manage alone where it cries for another family reunion, eventually calming down and conserving its energy. After 3 1/2 weeks of age, the harp seal can then swim and feed on its own, a behavior which becomes increasingly better with practice. While the pup is stranded on the ice, the danger of Polar Bears and humans becomes its worst fear. Polar Bears feeding on young Harp Seals is part of the circle of life but humans killing these pups during the yearly Seal Hunt is one which is a brutal, slaughter with no sense of passion for these cute baby animals. 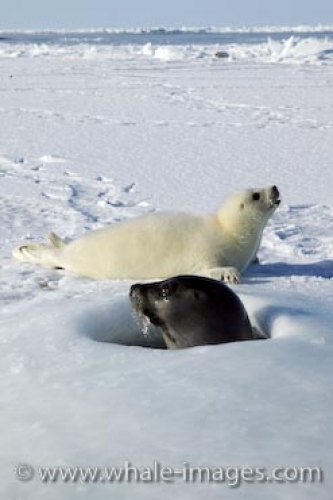 The Harp Seal quota during the hunt for 2007 was 270,000 and in 2008, the quota reached 275,000 seals. Most of the Harp Seals hunted are under the age of three months where they are clubbed or shot and left to suffer on the ice and repeatedly clubbed again. They are then skinned and the pelts are sold, but those prices have dropped considerably in the last few years as many people around the world are protesting against these vicious acts.